The Boston Globe uncovered a scandal that reached beyond the city and up to the highest levels of the Catholic Church. With some hesitation, a small group of investigative reporters looked into reports of priests molesting children. Their column called “Spotlight” often featured scandals and corruption but this investigation was met with stonewalling at every turn. The Catholic Church and the Boston diocese under Cardinal Law was powerful in the local community. The reporters included Mike Rezendes (Mark Ruffalo), Sacha Pfeiffer (Rachel McAdams), Matt Carroll (Brian d’Arcy James) who reported to Walter ‘Robby’ Robinson (Michael Keaton) and him to editor, Ben Bradlee, Jr. (John Slattery). A new Jewish editor-in-chief arrives from Miami. 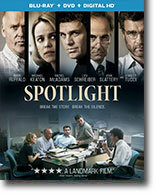 Marty Baron (Live Schrieiber) wants to instill new life into the paper and sees “Spotlight” as key. What makes the film special and interesting is that director Tom McCarthy (“The Visitor”) keeps thing moving quickly and shows some of the grungy details that reporters go through to get a story right. Constant rejection, door-to-door inquiries and sifting through an unending supply of books, news clippings and other documents provide a real sense of the grunt work involved. While the acting is superb at every level, I will take note in particular of Ruffalo and McAdams. Aside from their commitment to the story, they have different ways of getting their information. Mike is relentless in his pursuit and shows his passion outwardly. Sacha is quieter, more sensitive to her sources and methodical. Both characters and actors are brilliant. Robby is also the antithesis of Marty. He’s aggressive, persistent, willing to get his hands dirty and supportive of his reporters. Marty is quiet, reflective but not afraid to take on budget constraints or the Church hierarchy. The contrasts in the characters and their personalities make the film interesting and absorbing. The lurid subject matter is handled with a soft touch by McCarthy providing a perfect example of the power of a free press. Character to watch: Mark Ruffalo as Mike Rezendes.